Yesterday was a better day. While still here in Seville, i visited the Reales Alcazares, which is a giant palace and gardens originally devloped by the Moorish Kings. The palace is absolutely beautiful, with gorgeous tiles with intricate patterns. There is even a display of the different types of tyles and patterns, and how they we're made. Some of the tiles/patterns are hard to read-In one room, a mosaic tile was supposed to include drawings of the king and queen. I couldn't find them. And it was now I cam across an amazing coincidence. I asked an older couple next to me if they could find them, and the man said "Oh, it's you again". I reallized I met this couple before way back in Lisbon, waiting for a hop-on hop-off bus. We talked for a while. This couple was from Holland and retired, and driving their motorhome down through Portgual, Spain and some other countries. What is most beautiful are the gardens in the Reales Alcazares-Dozens of gardens seem to be part of the state, including names like Garden of the Dance, The Princess Garden, and many many others. These gardens have intricately cut hedges, fountains, the whole nine years. 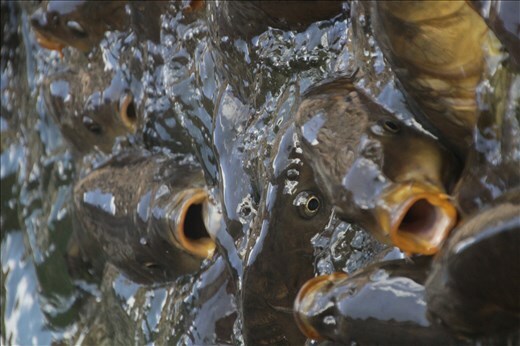 One has a pond with the huge fish that when presented with food, ravenously come to the top of the surface. Another has a fountain that plays to an organ, on the top of every hour. Still others have peacocks roaming around, hedges made into mazes, etc. I entered Real Alcazares around 11 and didn't leave until around 5:30 pm. After a short rest at the hotel and a dinner of beer and some tapas (Tapas are served everywhere), I went on a walking tour of the district. I actually tried to go on the walking tour the night before, but I was the only one, and didn't want to go if it was myself, the guide, and some interns. This time, a dozen of us showed up for the walking tour, mostly 19-20 year olds from some Medical Program at University of Connecticut. The tour was intersting-it took us to the opposite side of the river, which I haven't visited, (it is easy to get to-I just haven't bothered). I learned that this is where the gypsys settled, unitl they we're kicked out in the 1960's. I also learned that the gypsys started Flamenco, as they did hard work with anvils and hammers, and they used these to communicate in the factories where they worked, as they we're forbidden to speak their own language. These anvils sent the beat for Flamenco. Earlier on, this side of the river was where the Jews and Muslims who we're banished from Seville we're sent to live (no bridge existed yet).